Shake table at UCSD. Photo courtesy of UCSD. UC San Diego announced Thursday that $5.2 million from the National Science Foundation will allow the university to continue to operate the world’s largest outdoor earthquake “shake table” for the next five years. The table, which can carry structures weighing up to 2,000 tons, replicates the ground motions of large quakes. 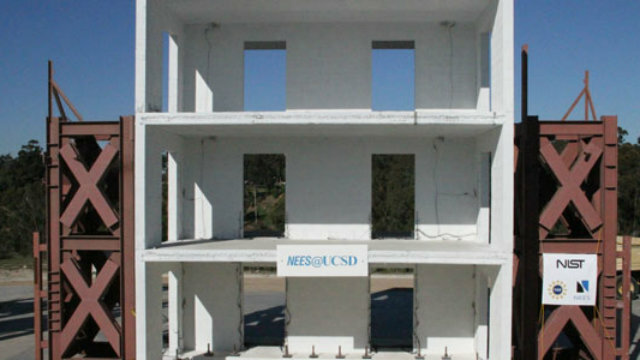 Located off-campus in Scripps Ranch, it’s been used for 11 years to test seismic safety ideas, which help new buildings withstand temblors or be used to retrofit older structures. In the past 11 years, research at the shake table has led to changes in design codes for commercial and residential structures and insights into the performance of foundations, tunnels and retaining walls, according to UCSD. In an application of the research, around 6,000 buildings in San Francisco are being retrofitted with a system tested on the shake table by Colorado State University professor John van de Lindt, according to UCSD. Researchers with the Worcester Polytechnic Institute and University of Arizona have also conducted important tests on the table. UCSD officials said massive amounts of data are collected from the tests via networks of hundreds of sensors. The data are made available to civil engineers around the world, who can use them to validate and increase confidence in their own models, without having to perform their own tests.